Time-lapse footage showing the creation of 'Market'. Painted in 2018 on a wooden panel, measuring 40cm x 40cm, in acrylics. The painting shows a view of Surrey Street Market, in Croydon, Surrey, on the edge of south London. Time-lapse footage showing the creation of ‘People’. Also painted in 2018 on a wooden panel, measuring 40.1cm x 40.8cm, in acrylics. The painting shows a view of Surrey Street Market, in Croydon, Surrey, on the edge of south London (but with fewer vegetables than the other work). 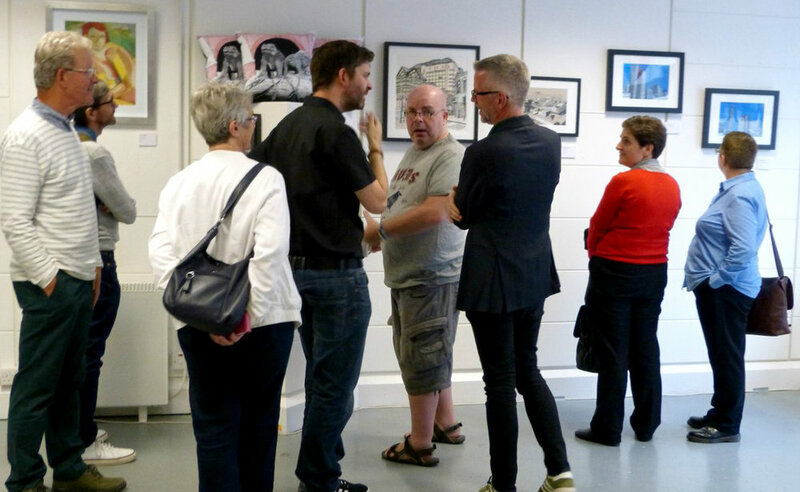 The opening evening of my 'Featured Artist' exhibition at the Studio Upstairs gallery in Croydon went well, with a good attendance and some impressive live music from 'Five Minutes Later'. Not only did I have some selected pieces at the front of the gallery, but I managed to take over the window, too, with a range of artworks, cushions, prints and other merchandise tastefully arranged by the gallery. I've attached here some photos from Studio Upstairs, and used with permission, along with links to some video that they shot on the night. 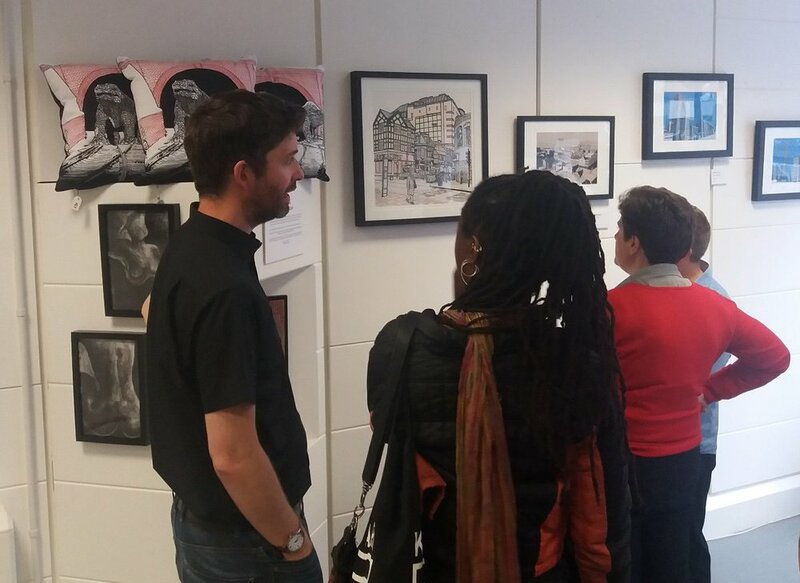 The work is available to view and buy until late August, Monday to Friday, 10am to 5.00pm at 2-4 Park Street, Croydon, CR0 1YE. 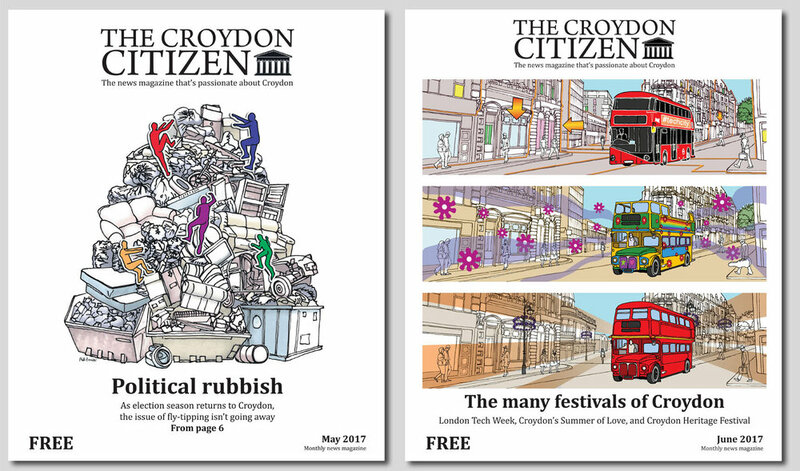 In the last couple of months I have been commissioned to design TWO covers for the Croydon Citizen newspaper. Here are the results. Though both inked with real ink and coloured with real, er Photoshop, their subject matters are quite different. May's cover was an amalgam of the annoying problem of fly-tipping in the Croydon borough with the, then, forthcoming general election. Politics is rubbish, indeed. June's was to celebrate three community festivals taking place that month. Each 'strip' featured a London bus driving down the High Street near the end of Surrey Street. The first: Tech City (hence the modern street scene with sci-fi orange pipes and hovering digital signage). The second: The Summer of Love event in Wandle Park, channeling the spirit of 1967. The third: the Croydon Heritage festival celebrating all of Croydon's past but I was asked to go for the 1950s in order that the Routemaster bus made sense. I've also added some crocus decorations inspired by the new art installation by artists Aether and Hemera, commissioned for the Heritage Festival. Each 'strip' contains people and buildings, but the eagle-eyed will notice that the clothes of the pedestrians alter slightly depending on what era they are in. Also, I've endeavoured to mimic the architecture of Surrey Street in the background by changing the buildings. I wasn't until I did this illustration that I discovered that an old cinema - called The Palladium Cinema - used to stand at the end of Surrey Street, where The Market Tavern is now. Read more about it on Cinema Treasures and see a lovely photo of it in the 1950s on Flickr. I will be showing some of my Croydon inspired art work at the new Studio Upstairs gallery in Croydon, later this month. On Thursday 29th June, I will be there from 5.30 to 7.30, talking about my work (along with another artist, Sharon Smith). I hear that there will be some live music, too. My work will be on display until 27th July and the show contains some brand new pieces featuring one of London's most talked about boroughs. 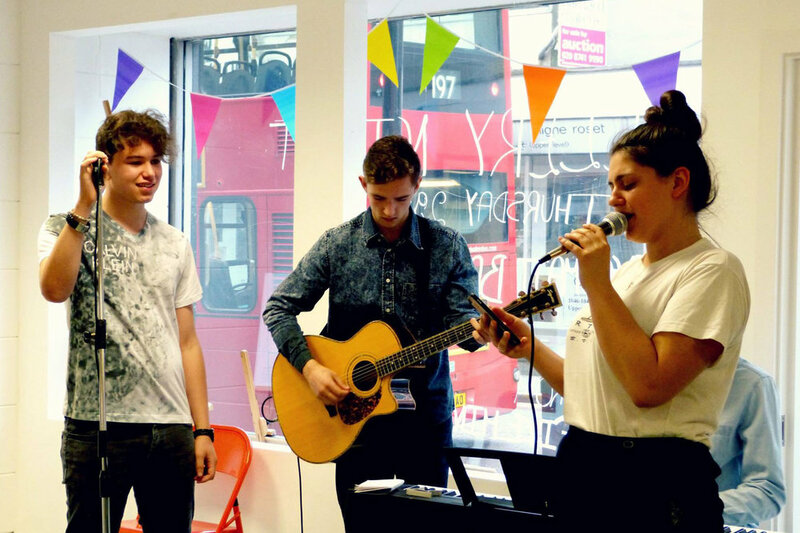 is a charity that works to help people with emotional or mental difficulties by teaching them art techniques and providing studio spaces to create their work in. 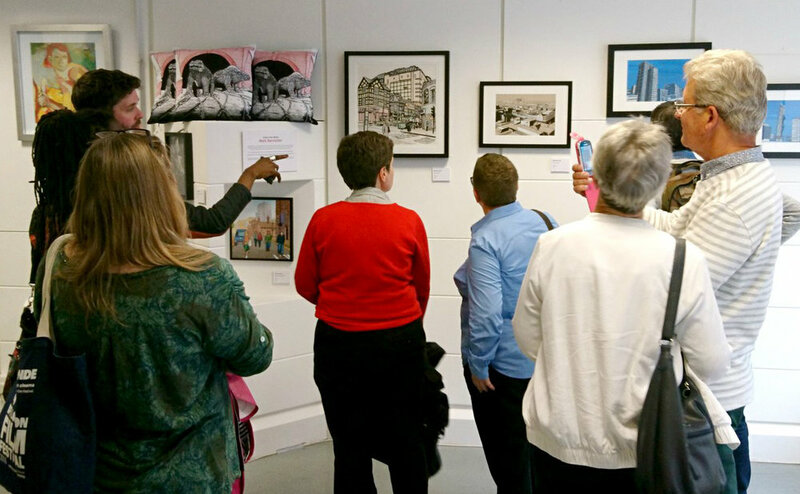 They have monthly events with established artists to help draw attention to the organisation and to also provide an exhibition context for the work of some of their members. 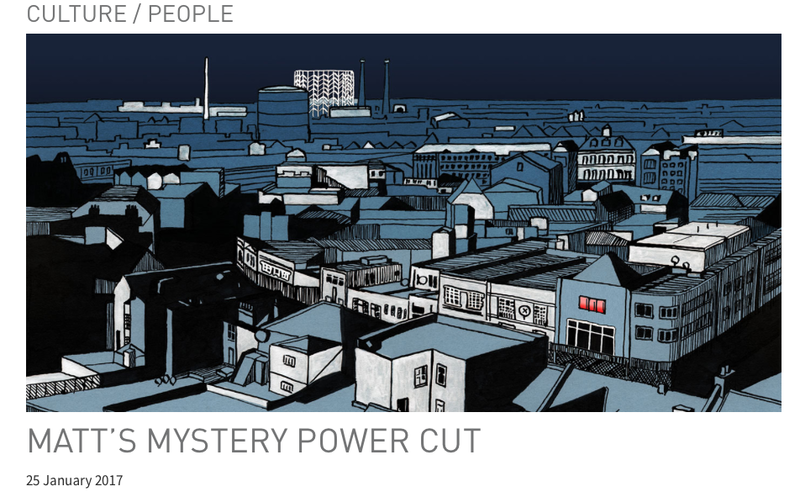 You can now read about some of my Croydon likes and sources of inspiration in a recent interview I did with south London culture website Croydonist. They're a great team and have a really slick website. I suggest paying them a visit. 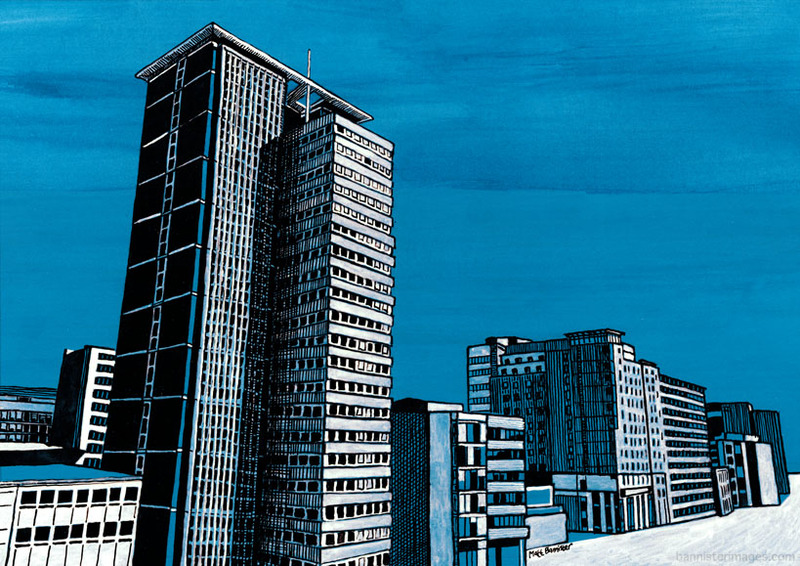 Artist and illustrator, based in London, UK. Creating illustrations and artwork inspired by people and places.